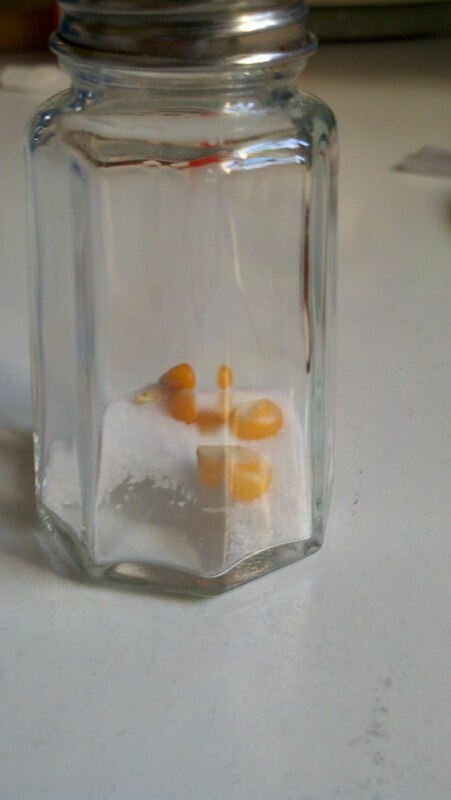 To reduce moisture in your salt shaker, be sure to put dry corn kernels in it. The dry kernels will absorb the moisture. Many use rice to do the same thing, but dry corn works much, much better. It has only been the last few years that rain barrels have become very popular. What was once an item that you could only get online or in specialty stores (or make your own), has moved into the mainstream in many popular outlets like Home Depot, Lowes, Target and even in many Walmarts. Just like any other product, a rain barrel comes in many shapes and sizes and can be as low as free, if you can build your own and hunt down some basic parts you will need, up through a few hundred dollars. I have seen good ones at a local home center for $99. Here is how a rain barrel works. As the name implies it is a barrel or big container with an opening at the top. 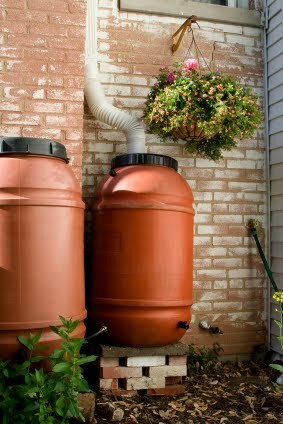 Most rain barrels allow for that top opening to have your home’s downspout connected to it, so that when, as you guessed it, rains, the rainwater flows into the barrel. Then you reuse that water later as opposed to turning on your hose, sprinkler system and so on. For many parts of the United States, storing water for later use can be invaluable since these parts go through dry periods for weeks at a time. However, like I found out, for some parts of Colorado, a rain barrel can be illegal. Why? I am not sure on that, so if you live in one of these areas where you are not allowed to have a rain barrel, please let me know. I would be interested in hearing the reasons you were told you could not have one. There are some downsides to a rain barrel that you need to know about so that you are prepared to tackle them. I turned to William Berg of “Orchid Flower HQ” (http://www.orchidflowerhq.com/) who is an avid user and supporter of rain barrels. “The water you end up collecting might be of poor quality and contain unwanted chemicals. Collected rain water is not nearly as clean as people think.This is usually not a problem with hardy plants but can be a problem with more sensitive plants and is a big problem if you want to use the water for other purposes such as for animals or in aquariums. The water collected may be tainted due to several reasons,” says William. One final note on what you should look out for are mosquitoes. Still standing water can be a great breeding ground for mosquitoes. So make sure your rain barrel is as tight as possible and try to use the water collected at least once per week, even if it’s a little bit, to keep the water moving. In the event you see the barrel start to gather some mosquito activity, drain the barrel, dry it out and start over. If you have been reading my blog articles or listening to my podcasts, then you probably know by now that 100% of the gardening that I have done in my life happens in New Jersey. While I won’t say we have the greatest weather in the world, I really can’t complain either. We get spring, sometimes, and then that leads into the hot and humid summer months, where my tomatoes, peppers and zucchini really thrive. Autumn gives us a short but extended growing season, and throw in some cold frames, and winter offers up some great possibilities. What I have found after speaking with so many fellow gardeners from around the country on our vegetable gardening Facebook page is just how completely different many areas are. Not that I was completely surprised that trying to grow something in the hot Arizona desert or the frigid temperatures of the Northern states would be different than here in New Jersey. 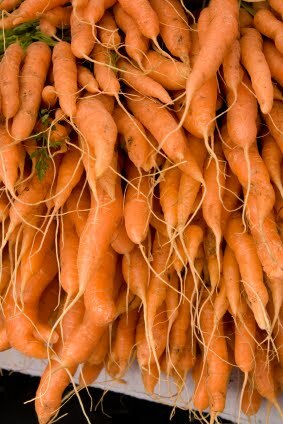 I was more fascinated as to what they grow and the amount of time they have to grow it in. Once such area that caught my interest was the great pacific Northwest, specifically Seattle and the surrounding areas. Since they do not receive the long hot summers that we do here in New Jersey I was curious as to how they grow tomatoes, peppers etc. I turned to fellow gardener, Lisa Hill, who resides in Bellevue which is on the east side of Lake Washington, just east of Seattle. I asked Lisa what she finds the most difficult to grow and what she does to overcome those difficulties. Like here in New Jersey, every area has their favorite or “go to” fruit, vegetable or herb as the choice that simply can’t fail to grow. Lisa says cooler weather vegetables grow great in her area. She prefers broccoli, kale, mustard, cabbage, collard greens, leeks, onions, sugar peas, spinach, carrots and a mesclun green salad mix. “My backyard has the old variety of Rainier cherry trees, plus two grafted apple trees and two plum trees. My raspberry patch expands by itself in a sunny spot. Strawberries are picked in mid June, and raspberries July to September. We can grow blueberries but they need somewhat wet feet,” says Lisa. With all these great choices, even in a “not so hot” shortened area like the Pacific Northwest, you can still grow a wide variety of fruits, vegetables and herbs right at home. It was my dad that introduced me to vegetable gardening and my grandfather that introduced him. Where it started, in my family, prior to my grandfather, I have no idea, but one thing is for sure, and that is our family loves to grow fresh fruits and vegetables. Now that I have two sons of my own, I have been introducing them to it and thus far, they seem to love it. I recently read an article in Parents Magazine that gave a piece of helpful advice on spending more time with your kids, and that was to incorporate your children with the activities that you are doing. For example, changing the batteries in the smoke detectors. While I change them batteries, I have my kids hand them to me. That sort of thing. I put this piece of advice to the test for gardening. The other day I was outside getting the garden ready for the upcoming season. In past years, I would just go out and do what needed to get done. This year, I decided to get the kids involved. Luckily, my kids have their own garden tools, compliments of Grand mom. This makes the process of getting them involved a whole lot easier. The specific project I was working on was to remove the dirt from a large box that I built a few years ago to grow potatoes in, and put that dirt back in the main garden. I grabbed my trusty shovel and asked them if they wanted to help to get out their shovels. They are young, so of course I wasn’t expecting much in actually speeding up the job, but I was pleasantly surprised as to how excited they were to use their tools, dig in the box and take the dirt over to the main garden. Surprisingly, most of the dirt on their shovels actually made it over there. My next incorporating advice was to see if they would like planting the seeds. I always start most of my seeds indoors in a propagation dome and use my kids’ leftover yogurt cups (as well as mom and dad’s k-cups), filled with soil from my garden. This project was 3 fold, of which, I “let” them do all the work. With plastic spoons in hand, a Tupperware bowl filled with soil from my garden, the kids were to fill each seed starting cup with soil. Needless to say they loved it, although my youngest at times felt it was more fun to fill the seed starting cups by hand. I’ll save that story for another time. Once the cups were filled, I gave them each some seeds they were to plant. They were different varieties of lettuce and spinach. I then showed them how to pinch the seeds with their fingers so they did not put too many seeds in each cup. They got the idea, however, some of the cups did get a lot of seeds. On a side note, I hope the neighbors like Oakleaf lettuce. Finally, I had them cover the seeds with a little more soil and give it a watering. I did the watering. Visions of flooding my kitchen floor danced through my head. This was a great project for my kids and was fun for them and for me to watch. 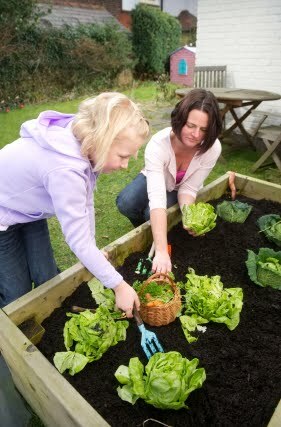 It was all about showing my kids how to get the seeds started and they really took to it. My oldest son looks at the seed cups everyday to see if anything has sprouted. He is really getting into it and that is awesome! Now wait until I show them how much fun weeding is in the middle of July! My dad’s tool of choice for his garden was his trusty pitchfork, which he has since passed on to me. While I love using the pitchfork and digging in the dirt, nothing speeds up cultivating the soil faster than using a tiller. A good tiller will turn any large cultivating job into a quick one. However there are features and benefits you should be on the lookout for so that you do not pick the wrong one and get one that is either too small or too large for what you need. The two types I am going to focus in on are front and rear tine tillers. There are also cultivators, which I will talk about in a future posting. These types of tillers are designed for a small to mid sized garden that has been previously tilled, or had the ground broken. They will be able to break ground for a new garden if the conditions are ideal and that means the ground has be very soft. Such a condition would be after plenty of rain or a heavy soaking to an area. As the name implies the rotating tines are in the front of the machine. Many of these require that you “pull” the tiller for best results, although there are models where you can push. Most, if not all variety and brands of front tine tillers have an OHV engine. This is a type of piston engine where rods are used to actuate rocker arms. Newer models could have an OHC engine, but the process of the tiller is still the same. Popular features on front tine tillers include handle mounted tine engagement, adjustable tilling widths (as much as 24 inches), and an adjustable wheelbase. Not all brands will have these options so if they are important to you, then make sure you request them from the person selling you the tiller or read the box and/or product specs. The benefits of a front tiller give you excellent power for tougher jobs and the tines in most models are self sharpening. The chain case in many varieties are enclosed therefore it is virtually maintenance free. With brands that offer an adjustable width, this will give you more versatility for varying conditions. As its name implies the tines are in the back of the machine. 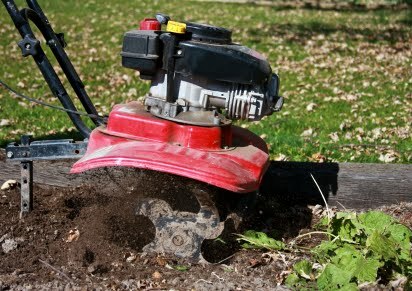 These types of tillers are designed for larger sized gardens and with the power they provide can tackle difficult jobs. They have large engines and like front tillers the chain case is sealed and comes pre-lubricated to reduce maintenance. On many models the tines will counter rotate and that will help you break up the toughest of soils. They are also adjustable to various depths which will allow you to set your tiller to a preferred tilling depth. They have adjustable side panels which will keep tilled soil in a defined area and top notch brands of rear tillers will have large fourteen inch agricultural tires as well as a serrated trailing shield which smooths out the tilling path (this is an added feature, so make sure you ask for it). There are many companies that make both types of tillers, so if you are brand specific with gardening tools, chances are your favorite, makes a tiller. Be sure to select a tiller that meets your needs, but not one that is too large for them either. If you have an eleven foot by eleven foot tiller, you won’t need a rear tine model as a front tine tiller will do (you get the point). Also be sure to check what type of engine for fuel it takes. They usually are either 2 stroke or 4 stroke engines. To read more on how these engine types differ be sure to do Google search on “2 stoke engine 4 stroke engine differences”. Hutto Elementary School serves pre-K through 4th grades and special needs units. There are 553 students enrolled and the school was founded in 1985. They have constructed 32 square feet of garden beds that are utilized by various classes for hands on exploration and integrated lessons. The decision to start a gardening program was made because teachers wanted more outdoor investigations for science and math to meet the outdoor exploratory requirements from the TEKS. Each grade level classroom has its own square foot garden bed that give teachers the ability to facilitate learning plans around. Students are given their own area to plant seeds, nurture them, record observations and the of course harvest. A garden gives their students that ability to bring to life teachings from the class room. 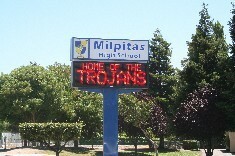 The winning school with the largest enrollment this year in our Seeds for Schools program is Milpitas High School located in Milpitas, CA. With a 9th grade to 12th grade enrollment of 2,945 students, Milpitas High is just starting their school’s gardening program. Their decision to start a school garden was made to reclaim a part of the campus that had been used to store junk and trash and create a garden where their special education students could get exercise, and learn skills for recreation. “This garden would be a boon to [our students] in terms of learning social skills,: said Dave Sorenson a faculty member at the school and the submitter of the application. 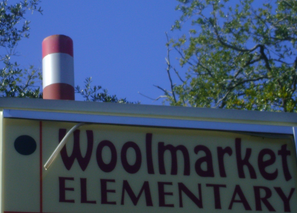 Woolmarket Elementary school is a rural, county school within the Biloxi city limits. Founded in 1910 as the first consolidated school in the state, it currently has an enrollment of 581 students made up of grades Kindergarten through 6th. Shirley Hardman, a teacher at Woolmarket, and the submitter of the application to our Seeds for Schools program, said the idea for a school garden came a little more than 3 years ago when her classroom was moved to another room that was next to the neglected courtyard. This year Woolmarket was able to raise enough funds to add in a pond and touts the entire outdoor project as a hands on science environment which will increase interest in environmental stewardship. As a side note, after this was written, Ms. Hardman informed me that WLOX ABC out of Biloxi visited the school and did a news broadcast on Woolmarket winning the seeds. She said the kids absolutely loved the experience and now can’t wait to get their hands dirty and grow some fresh fruits, veggies and herbs. San Jose, CA is represented for the second time in our Seeds for School program this year with Pre K through 8th grade recipient, Almaden Country School. Barbara DeMoss, fairly new to the school, is the science teacher and resident gardener as well as the submitter of Almaden’s application to our porgram. 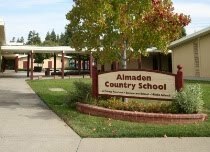 Almaden, boasts a garden 60 feet by 100 feet and Ms. DeMoss’s plan is to incorporate the garden into the science department and make it an outdoor classroom. Ms. DeMoss’s plan for the seeds is to expand their school’s garden and use that as a teaching tool to connect the students to the outdoors through science class and lunchtime learning programs.